Pricing is for the current sales period. Prices may not always accurately reflect your returns as stock may be held over pending sale or as the market dictates. Where no price is recorded, sales have not been made in the report period. Prices are subject to change based on daily market conditions. Packing/Packaging costs should be deducted from these prices. A fortnight can be a long time in this industry. Last week showed us that two days can have significant consequences when planning picking, packing and sales activity. Last Tuesday I was pushing our team to increase packing and stock-on-hand levels because current stock numbers were light and values stable. By Wednesday, all of our plans had changed as the Australian export market jumped, and export packing sprung back into life. Rather than a focus on how to manage supply at lower stock levels, harvesting and packing jumped a gear and we quickly reverted to the more anticipated strategy of handling large incoming volumes. In other words a return to the position we had experienced previous to the slow-down. The challenge for us for the next four to six weeks heading into Christmas is for ALL industry players to learn to keep their ‘pants up’. Growers should be challenging their domestic marketer as to where their fruit is going, what programme it’s heading into and what return expectation the marketer is anticipating. Yes, up-coming volumes will potentially be very high but so what? As an industry we have seen a significant volume lift this season and we should have some confidence that we have the support of our retail partners and our consumers. The support from both of these sectors has been well-proven and those marketers with definitive selling channels and promotional plans in place will continue to move good volumes at sustainable values. 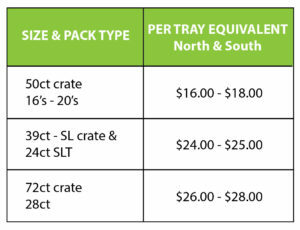 There is also a challenge in this for growers and packers. ‘Pick-to-pack-to-market’ timeframes are as important for the domestic market as they are for export. The higher level of fruit maturity this season combined with large and increasing inward fruit volumes does not allow us significant ‘wiggle-room’ should stock arrive in a compromised quality condition. 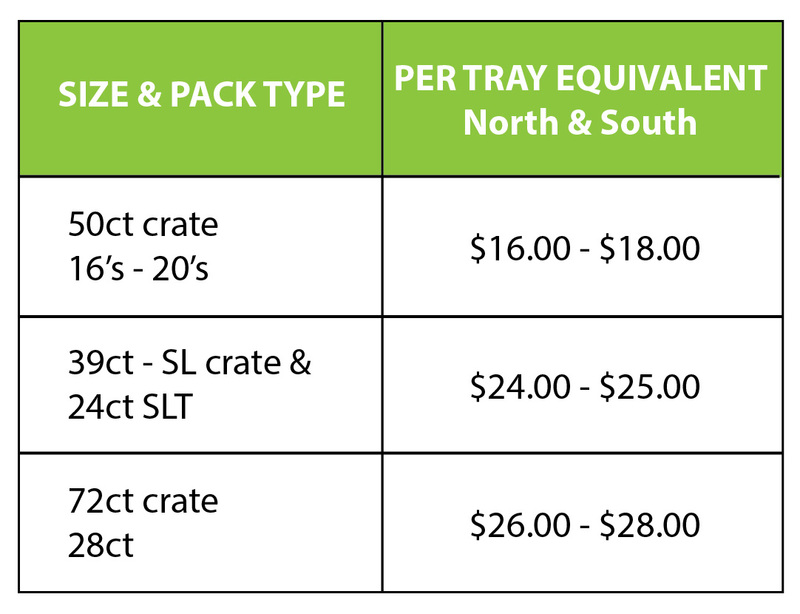 As we look ahead at our pricing models I see little change in place for this week but we do note potential price pressure if local market volumes continue around 70,000 + trays per week.